We already saw MLB.com At Bat make an appearance in USA Today’s demo of CarPlay during Apple’s WWDC developer conference earlier this month, and today Apple has updated its CarPlay microsite to include the baseball-dedicated app to its list of apps that support the feature. 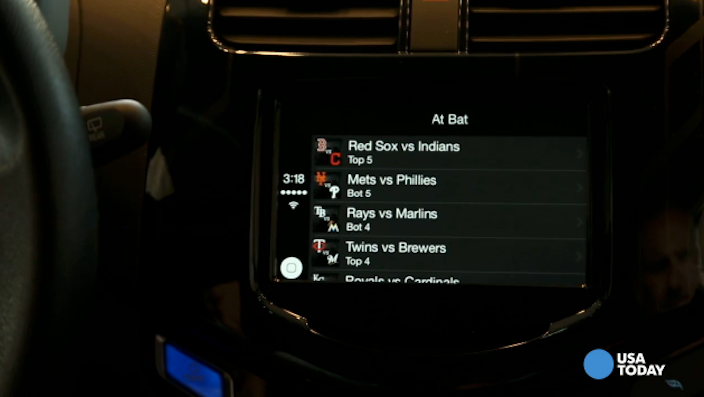 In the shot above and below you can see the icon for At Bat as well as a preview of the CarPlay specific user interface from USA Today’s demo. The app is expected to support streaming audio from baseball games for MLB.com At Bat subscribers. MLB At Bat is the first app to join the CarPlay compatible apps announced earlier this year with major third party apps like Google Maps and Pandora Radio notably lacking support. As it stands currently, though, Apple is the gatekeeper for integrating CarPlay support as it decides which apps it wants the feature to support. The app joins Apple’s own CarPlay apps which include Phone, Music, Maps, Messages, and Podcasts as well as third party supported apps including iHeartRadio, Spotify, Stitcher, and Beats Music (although Apple has announced a deal to purchase Beats Electronics and Beats Music making it an Apple-owned app). CarPlay availability has already been announced in automobiles offered this year by Mercedez-Benz, Ferrari, Volvo, and Hyundai, and Honda is also a CarPlay partner committed to shipping the feature in its vehicles this year although it has not yet announced support. Both Pioneer and Alpine have also committed to ship CarPlay solutions in aftermarket in-dash displays this year with Pioneer promising the feature in a firmware update available soon. MLB.com At Bat is available on the App Store (although it’s not clear if the current version features CarPlay support yet) and requires an annual subscription of $19.99 to unlock the full content.